If you need further assistance in finding a detector please contact your nearest distributors or contact us directly. 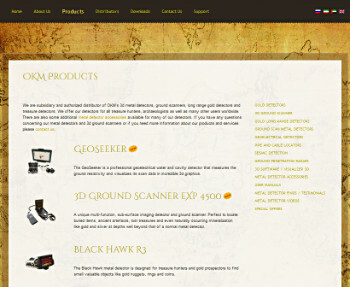 On our official company website you get a complete overview about the company, the 3d metal detectors and other products, the discoveries made by our customers as well as a lot of other information around metal detecting and treasure hunting. 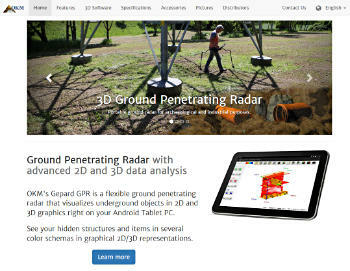 On this website you will find detailed information about the "Gepard GPR" ground penetrating radar like technical specifications and the scope of delivery. This powerful ground radar is used to detect underground cavities, tunnels, cable harnesses as well as treasure chests and the like. 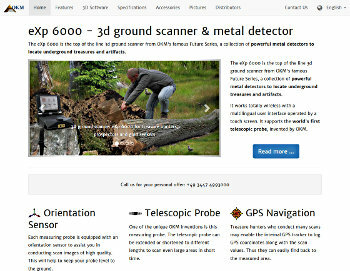 This website informs about the eXp 6000 ground scanner and metal detector that has been designed for treasure hunters, archaeologists, gold seekers and ground surveyors. It is the world's first wireless ground scanner with a telescopic measuring probe. Advanced detection features and modern technologies like touch screen, video eye glasses, GPS and WiFi transform this detection device into a very special and unique detector. 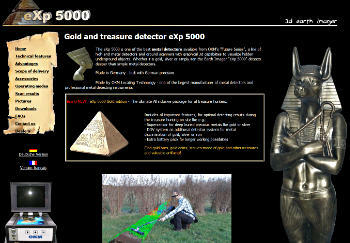 On our website about eXp 5000 you receive information about our best 3d metal detector. The unique livestream technology allows a live image of the underground in real time. Via the video eyewear you can see the 3d scan of the underground in brilliant resolution. Check out this website to find out more about the special features and advantages of this 3d earth imager. 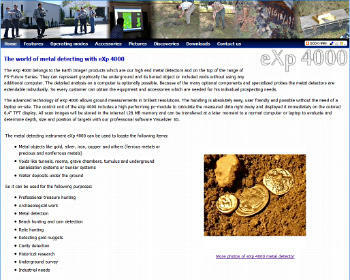 On this specialized website you can find detailed information about the treasure detector eXp 4000, its operating modes, accessories, detailed photos of metal detecting with eXp 4000 on-site and many testimonials. 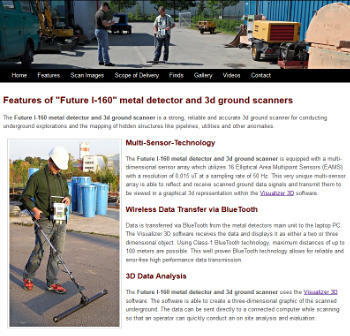 This website contains information about the Future I-160 metal detector which can be used for archaeological and industrial task like the detection of pipelines. The visual representation of the underground in a three-dimensional graphic is the special feature of OKM metal detection products and geophysical instruments. In this way hidden objects and cavities can be uncovered, without the need of an excavation. 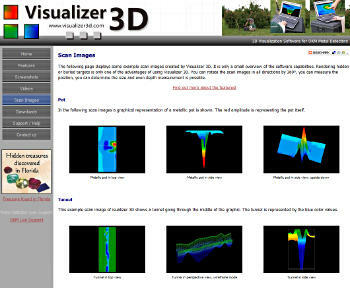 The website about Visualizer 3d explain its features, shows screenshots, gives technical help and offers downloads for a free demo version. 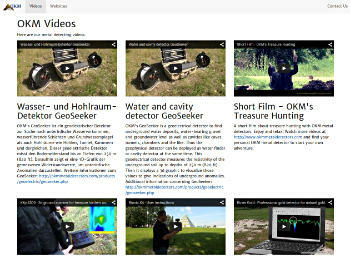 Learn everything about OKM's long range gold detectors of the Bionic Series. 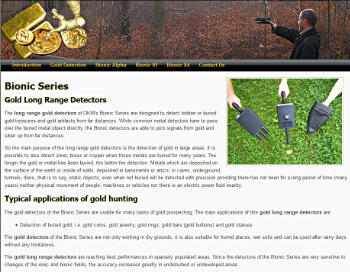 Long range gold detectors are used to locate gold treasures and deposits in far distances. 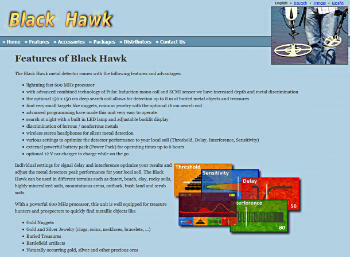 This website contains information about the Black Hawk gold detector which is suitable for gold seekers and treasure hunters. Its easy handling supports treasure hunters and gold prospectors in finding valuable metals near the surface. Visual and acoustical feedback allows easy recognition of underground items as well as metal discrimination between ferrous and nonferrous metals. OKM Emirates FZE, OKM subsidiary in Sharjah, U.A.E. 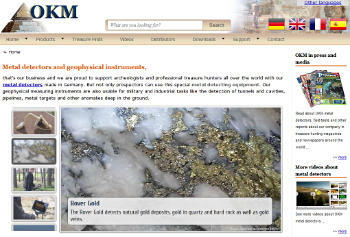 This is the official website of OKM Emirates FZE, the subsidiary of OKM Germany. This company is situated in Sharjah Free Zone, near the international airport. OKM Emirates is the direct contact for all Middle East customers. On the website of OKM Emirates you can also find OKM product information in arabic language. This website has been specially created for our customers in the US, but also includes useful OKM support material for all our customers worldwide. You will find training videos, user guides and information about our wide range of 3d metal detectors. You can also find contact information of our representative in the US, who has field experience and who will support you with any issue you have. He will also assist you in analyzing your 3d scan images. 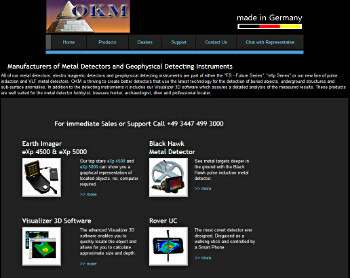 On this page you find videos with interesting and useful information about OKM metal detectors and its handling. There is everything like product presentations, learning videos as well as complete instruction videos.